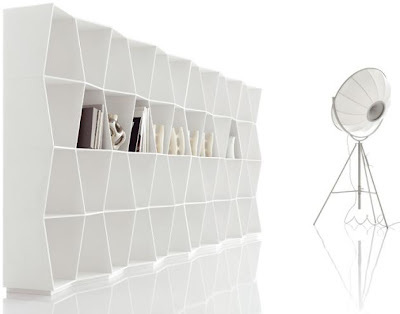 Wavy is a bookshelf system that rigorously combines design and function. It is a minimalistic product in which the thin structure and the wavy design, both vertical and horizontal, gives the ensemble an image of great solidity and lightness. With its extremely characteristic accuracy of detail and use of materials, Wavy is made entirely of "HI – MACS Natural Acrylic Stone" by LG in S28 Alpine White colour. Composed of blocks that can be laid one upon another and combined, Wavy conceals any kind of joint, thus becoming a highly elegant furnishing element with an extremely formal linear nature. It may be arranged as desired: superimposed vertically with module H.36, or horizontally, composed of 3 elements which may be combined: cm. 63 – cm. 124 – cm. 185.
so stylish bookshelf ! It looks like an item from sci-fi movie.